Sat., June 16, 2018, 8:33 a.m.
A GRIP ON SPORTS • If you gave up on the Mariners last night, you are forgiven. At least in this column. Something about not casting the first stone and all that. Read on. • The third inning made me angry. Not just that the M’s played their worst, weirdest defensive inning of the season and trailed 6-3 to Boston when it was over. The fact James Paxton was eventually saddled with five earned runs is what ticked me off. What does it take for an outfielder to get an error these days? 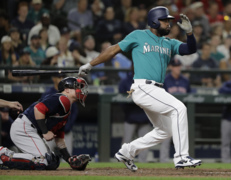 As the inning was unfolding – the Red Sox scored six times, the only runs they would score – the M’s were charged with three errors: Jean Segura’s bad throw, Mitch Haniger’s flubbed fly ball and Kyle Seager’s ground ball mistake. Eliminate those and Paxton, who will be a Cy Young candidate when the year is over, would have yielded one run. Just one. That’s how earned runs, and hence the earned run average, works. But somehow the official scorer, an anonymous guy whose work is somewhat akin to the Wizard in Emerald City, changed his mind on J. D. Martinez’s fly ball. Haniger, who dropped a liner the other night that also somehow didn’t earn him an error, took a bad route and still should have caught Martinez’s. I’m guessing he would tell you he should have caught it. Sitting at home watching on TV it was obvious he should have caught it. But he didn’t. And he wasn’t given an error. Well, he was. But then Haniger’s best friend (or something) changed their mind. The decision – a wrong one – cost Paxton four earned runs. His ERA sits at 3.44. If the error had stood it would be 3.14. That’s a big difference. And it’s not right. • My anger drove me away from Root and over to a movie. But I kept checking in. 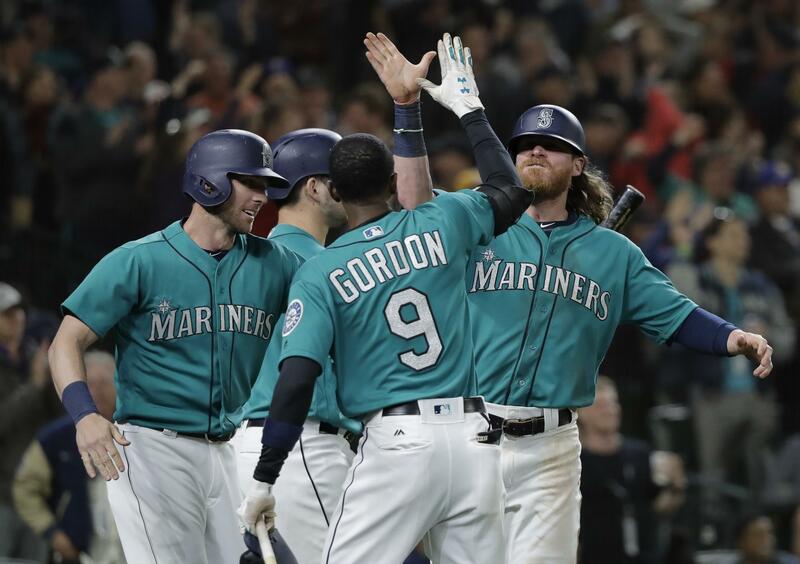 And when the M’s rallied – the new-look bullpen was perfect over 6 2/3 innings and Denard Span came off the bench in the eighth to deliver the key two-run double – I smiled. After all, to win a pennant, or even to earn a wild-card spot, teams usually need one or two surprising wins. Not just in the won/loss columns, but to keep the momentum going. The M’s were on a roll going into the series with the Red Sox, another of the American League’s best teams. The M’s felt invincible. But they lost the opener 2-1 despite one of Felix Hernandez’s best starts. And if they had thrown away another game, this one behind their ace, it would have put a big dent in their armor. Instead, the rally gives them another notch on their sword. That feeling of invincibility has to have grown some as they walked off the field. Momentum? It’s more than just today’s starting pitcher. It’s as important to them right now as any analytical theorem. • An errand last night took me down to the corner of Sprague and Havana around 6 p.m. What a mistake. I had forgotten it was the Indians’ opening night. Spokane doesn’t get many traffic jams bigger than those that occur around Avista when the Indians have a sellout crowd. The extra five minutes of fighting cars was worth it though. It’s good to see baseball can still excite people around here. And the amount of cars with youngsters in them reminded me once again of how much fun it is to be a kid headed to a ballgame, glove in hand, hat cocked to a side and a clean slate ready to fill with memories. WSU: Another basketball player has left Washington State but his roster spot has been filled by a recruited walk-on. … Elsewhere in the Pac-12, the College World Series begins today with Oregon State facing North Carolina. The Beavers’ offense hopes to carry the team to the title. … The Huskies are in Omaha and Washington coach Lindsay Meggs credits some tough love for getting there for the first time ever. … The new NCAA transfer and redshirt rules will be interesting to observe. … The football coach’s son is ready for his final season at Colorado. Gonzaga: The Bulldogs hired a women’s rowing coach. EWU: The Eagles’ are still well thought of nationally, if polls are any indication. Ryan Collingwood checks those polls and passes along the results. … The volleyball program has been in a state of flux recently. Yesterday, the Eagles moved to change that, hiring Leslie Flores-Cloud to fill the head coaching position. Jim Meehan has the story. … Football coach Aaron Best joined Larry Weir for a Press Box pod. Indians: The bottom line is simple. Spokane opened the season by losing to Boise 7-4. Dave Nichols has that story, which includes a late change at starting pitcher. Dave also has a story on the newest member of the team. … But there is more to the night, lots more. Ryan was at Avista as well and has a story on two Gonzaga products meeting up on opposite teams. He also has the news Tyler Johnson was in the park though without a Stanley Cup. And Ryan notes one player’s first game was marked by bruises. … Jonathan Curley took in the ambience from around the park. … James Snook adds a photo report. … Elsewhere in the Northwest League, Hillsboro got past Everett 5-2 at new-look Everett Memorial Stadium. … Host Eugene shutout Vancouver 2-0. Chiefs: Forward Jake McGrew is on Team USA’s initial roster for a junior event. Shadow: Forward Jake Levine won a national award. Preps: Jim Meehan has covered a lot of state golf tournaments. And he welcomes a change that is coming. Mariners: The M’s broke on top 3-0. Then came the top of the third when they left their gloves in the dugout. But the three-run deficit turned into a 7-6 win thanks to whole bunch of heroes. The bullpen was chief among them. As was Span. Published: June 16, 2018, 8:33 a.m.